Most famous yacht trip to Tiracol fort. It is situated at the northern border of Goa. 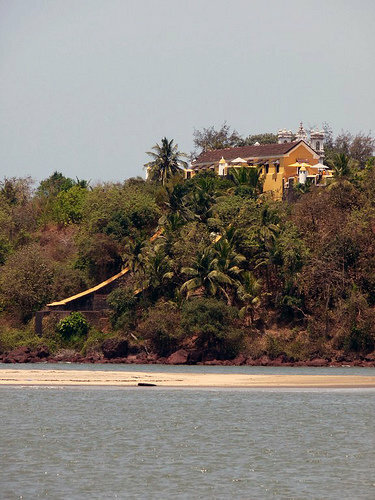 The Tiracol fort which is also a resort where many celebrities come here for their vacation. It was a lovely place to relax. The Tiracol fort overlooking the Querim beach and the Tiracol river originally belonged to a local King who had constructed it with an aim to monitor and protect the traffic along the river and the shore. This part of Goa is lush green and the same greenery is visible at every nook and corner of the fort and area below. Overlooking the beautiful Keri beach, on the coast of the Arabian Sea, the 16th century Tiracol fort is an architectural spectacle. This fort, situated on the north side of the banks of theTiracol river. Located in the fort with a awesome view below. Can go trekking jus behind it down to d rocky coast. It’s a best choice for honeymoon holidaying in Goa. It’s a quiet and romantic place to visit.